This course provides training for all junior officers, ratings, cadets and any officer person assigned duties and responsibilities related to the cargo or cargo equipment on liquefied gas tankers. It comprises a familiarisation training programme covering general principles and characteristics of liquefied gas tankers, basic knowledge of chemistry and physics related to their safe carriage in bulk, basic knowledge of cargo systems. 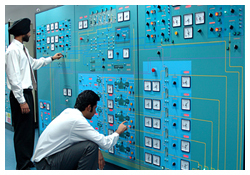 basic knowledge of engineering systems for cargo, occupational health and safety, application of safe working practices on board ship, prevention of pollution of the marine environment due to cargo, knowledge of the hazards associated with liquefied gas cargo operations, response to liquefied gas tanker emergencies, and basic working knowledge of the relevant international conventions and IMO codes. The course covers the requirement of section A-V/1-2-1 pertaining to the minimum standard of competence in liquefied gas tankers familiarisation training of the STCW code adopted by the IMO convention on standards of training, certification and watchkeeping for seafarers 1978, as amended in 1995. The familiarisation training for liquefied gas tanker is a mandatory course for obtaining of a level - 1 Gas Tanker Endorsement (DCE), which is a requirement under STCW Regulation V/1, for all seafarers wanting to serve on board liquefied gas tankers. Physics and chemistry of gases. Properties and hazards of liquefied gas. Types of gas tankers and their containment systems. Emergency procedures and first aid treatment.